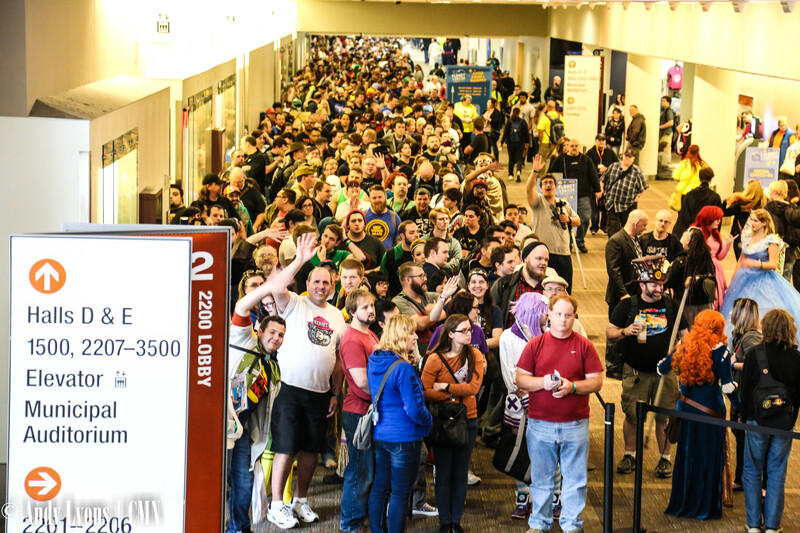 Sunday concluded the 19th annual Planet Comicon in Kansas City. Last year saw an attendance of more than 70,000 people, with a huge draw for legendary comic creator Stan Lee. Despite terrible weather, PCC was a full weekend full of celebrity guests, cosplayers, and more. Although Friday’s attendance seemed a bit lower than normal, Saturday and Sunday showed how big PCC is. Saturday’s attendance filled up any empty space for standing, after seeing that the floor layout had been expanded to take up the entirety of the showroom floor. There was always something to look at and always someone new to meet with their passion on full display. Media guests like Ron Perlman, actor for the titular “Hellboy” and Clay Morrow from “Sons of Anarchy;” John DiMaggio, voice actor of Bender from “Futurama” and Jake from “Adventure Time;” Jason Isaac, famously known for his role as Lucious Malfoy in the fan favorite “Harry Potter” franchise; and Summer Glau, known for her role as River in the beloved sci-fi series “Firefly” were all in attendance. Stephen Amell, who plays Oliver Queen in “Arrow,” but was there only on Saturday, drew one of the biggest lines ever to be seen at Planet Comicon. In addition to those celebrities there were almost thirty more in attendance, so no matter what there was going to be someone there fans needed to meet. Creative guests also saw a growth in popularity. There were many people there who were first time exhibitors and one group who wants to come again. GoComics had a massive display of creators that filled up two islands of tables. Creators like Sarah Andersen, known for “Sarah’s Scribbles;” Enzo Comics, known for “Cheer Up, Emo Kid;”1 Brian Gordon, known for “Fowl Language;” and Shen, known for “Owlturd Comix” were just a few of the many talented artists that lined up at the show. Meeting with Enzo, he said they were based in Vancouver, so the majority of the comic cons they attend are in the Pacific Northwest, but he would love to do another con at Kansas City. Many other artists helped fill the venue. Artists like Ant Lucia, creator of DC Comic’s Bombshells; Kevin Eastman, co-creator of Teenage Mutant Ninja Turtles; Amanda Conner, artist for Harley Quinn and The Pro, a comic series whose movie rights were picked up by Paramount Pictures in March of 2017; and even University of Central Missouri Alums Dan Scott, an artist for Magic the Gathering, and Mario Mora, also known as the Artisan Rouge, who has shown CMN the evolution of his art, were also in attendance. There were so many people to meet and so many things to do, that it seemed like visitors could spend the entire weekend there and still miss something. The only negative aspect of the entire weekend was a bit of confusion in the Celebrity Row area, where there are rules for not taking pictures. Many of the minions were giving out different rules stating that only press was allowed to take pictures, only to have another minion state that no one, including press, was allowed to take pictures. Despite the hiccup, there was more than enough positives to round out the entire experience and with such a highly successful year, it makes us look forward to next year’s event.